Firm and solid door lock / handle. The oversize heat exchanger is working in accordance with the counter-flow principle. More effective heat exchange, higher fuel efficiency and lower heating costs. The all-new Sveba-Dahlen panel is self-learning and easy to use, and it makes all you’re baking simpler. At the same time, this new panel gives you plenty of chance to develop your procedures and abilities. Patented steam system with very high capacity. Makes continuous baking without interruption possible. 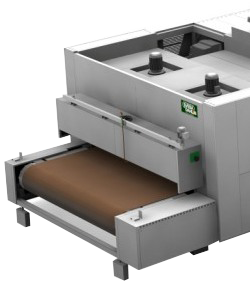 Increased Baking Surface – Sveba-Dahlen’s patented system for alternating rotation of the racks. Faster, more even and economical baking. Sveba-Dahlen has over 40 years of experience of manufacturing fermentation lines. The fermentation lines are manufactured in one or two level versions, and the size is calculated in view of the capacity requirements and the layout of the premises. The maximum band width is 4 meters, and the bands are threaded over the full width. A modular plastic belt is commonly selected where tins or plates are used. The fermentation channel is well insulated with cellular plastic and lined externally and internally with aluminum sheets or plastic. Most of the side panels can easily be removed to facilitate cleaning of the band. The conveyor provers are built in length according to the requested proving time of the product. The belt width can be up to 4 meters. Available in two different models, one with stainless steel covers and one with automatic climate unit built into an insulated room. A module system in width up to 3 meters which can be adjusted in height and length according to capacity and required proving time. The swings for loaves are with easy removable textile tubes and for round bread cups or baskets are used. 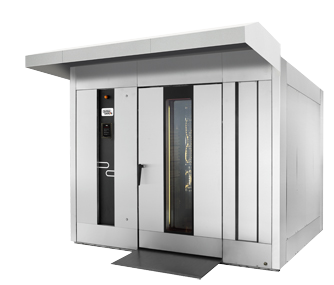 Swing prover with automatic climate unit completely built into an insulated room with free inner passage on both sides for easy cleaning and maintenance. A two motor operation enables a great flexibility in the modification of proving time and capacity. With separate burners for top and bottom heat in each zone the oven becomes very flexible and gets a very fast reaction time when adjusted for new products. Each zone is working independently since the temperature is set with individual temperature regulators in the same way as an electric oven. There is no need to adjust the temperature with dampers as on a traditional oven because the oven is set up at installation and there after everything is controlled with the control panel. The oven is very energy efficient; the burners adapt their heat output to the demand from each zone. When a burner fails in a “standard” oven with just one burner, then the entire oven shuts down. In the Sveba-Dahlen oven only the top or bottom heat of one zone fails. We manufacture the exterior of the oven in stainless steel. The materials in the oven chamber are specifically selected for each oven, for the baking temperature and the product range. All the ovens are insulated with rockwool to minimize the heat loss. The electric tunnel ovens are heated by tube elements with double heating spirals. The elements are installed over and under the oven chamber, along the entire oven, and are easily accessible from the side. Each element has its heat-emitting part positioned so that the band is heated efficiently over its full width. The tube elements are specially manufactured for each individual oven for maximum control of the heat distribution and quality. On an average, a tunnel oven consists of about 12 elements per meter. The control panel is designed to give best overview and simple control displaying baking time, temperature etc. PLC control with recipe handling of process parameters and handling of alarms and data logging is available as option. Connection to a master control system is another possible choice. In ovens built for connection to a steam generator, a part of the first oven chamber is provided with steam spreader boxes made of acid proof stainless steel. Regulating indicator valves with dial clocks are fixed on the sides of the oven to set the correct volume. Steam control with quantity control/photocell control can be selected as an option.